With the holidays in full swing, it’s the season to enjoy time with friends and family, and many in the island’s international insurance and reinsurance industry are taking time to give back to the community. Kevin O’Donnell, President and CEO of RenaissanceRe Holdings and current Chair of ABIR said, “ABIR’s most significant contribution to Bermuda is the more than $840 million direct economic impact to the Bermuda economy including millions in charitable contributions to local organizations. This December, Argo’s Bermuda office is supporting 77 children through the Foster Parents Association Angel Tree program. AXA XL Bermuda office, a division of AXA Group, holds a Kids Holiday Party each year at O’Hara House for children related to employees , requesting that each adult brings a gift suitable for children ranging in ages from newborn to 16 years old. The gifts can include clothing, toys or gift certificates. 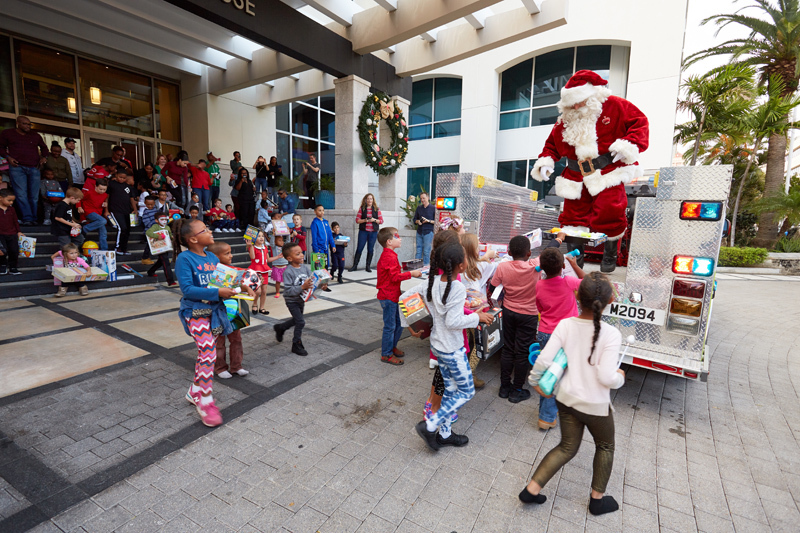 At the end of the party, the children happily helped Santa load up the gifts in a truck and they were given to The Coalition for the Protection of Children’s “Toys for Tots” campaign. Also, following the AXA acquisition this year, team members held a sale of XL Catlin branded merchandise for employees in the Bermuda office and raised more than $7,500, the proceeds equally distributed to seven local charities chosen by our colleagues. AXIS is also giving back; working closely with their Bermuda charity partners – including Meals on Wheels, Adara, and Bermuda Cancer and Health among others – to contribute time and resources to help friends and neighbors have a safe and enjoyable holiday. Over the last 10 years, AXIS has donated over $7 million to more than 80 local charities in Bermuda. Guy Carpenter and Company, as a part of MMC Bermuda, have supported Big Brothers Big Sisters [BBBS] charity through a shoebox giveaway. Volunteer staff members participated and were assigned a child between the ages of 5 and 17 to present a shoebox to, with the shoebox filled with gifts for the holiday season. MMC has also agreed to supplement staff members’ donations by giving each recipient gift cards, which total $2,500. This year, MMC Bermuda donated 87 shoeboxes to local children in need. PartnerRe is celebrating its 25th anniversary and another successful Dollars for Hours initiative: 2,000 students have donated 26,600 hours to local charities for a total donation of close to $3 million to Bermuda’s secondary schools. In addition, the PartnerRe 5K – Women Helping Women – is Bermuda’s largest all female sporting event and raised more than $35,000 to support the Family Centre this year. RenaissanceRe staff brought a little cheer to 45 children by supporting the Foster Parents Association of Bermuda and Big Brothers Big Sisters with their Christmas Angels program. Dozens of RenaissanceRe staff selected anonymous children as ‘angels’ and went out to purchase toys, clothes, electronics and sporting goods from the children’s wish lists this year. RenaissanceRe and its employees also assisted 100 vulnerable seniors by supporting those enrolled in Age Concern’s Hardship Program. Dozens of RenaissanceRe staff, along with corporate support, financially contributed 100 gift bags containing toiletries and also donated blankets, all items identified by Age Concern as very important at this time of year. “As ABIR marks its 25 years of innovation, growth and leadership, we celebrate the tremendous generosity of its member companies to the Bermuda community during the holiday season,” said John M. Huff, President and CEO of ABIR.